Series Of Mysterious Area 51 Crashes Leaves 'Red Hat' Squadron Commander Dead And Experts Warning Deadly Plane Crash May Have A Russian Link - RED ALERT WW3 False Flag Warning! In this massively under-reported story over at the Air Force Times from September 8th they report that Air Force Lt. Col. Eric Schultz died on September 5th during a training mission near Nellis Air Force Base as also heard in the 1st video below from a local TV station. Interestingly as we learn in the video and this linked story from The Drive, the crash happened just a day before two additional crashes involving two A-10 Warthogs in the very same area. As The Drive story and the video report, the original crash had not been reported by the press or the US Air Force and it appears that another cover-up was underway. While fortunately, in the two A-10 crashes, the pilots were able to eject from their planes and thankfully survived their ordeals, nearly every story we've found on the original deadly crash has variations of the word 'mysterious' in it for a few very good reasons. First of all, the crashes have been tied to the nearby top-secret Area 51 and this new stunner, according to The Aviationist and their 'unnamed sources', highly experienced 'Red Hat Squadron Commander' Lt. Col. Eric Schultz was likely flying a Russian aircraft. In a story published late Monday, September 11, 2017 on AviationWeek.com, new information has been revealed about the type of aircraft that USAF Lt. Col. Eric Schultz, call sign “Doc”, may have been flying at the time of his mysterious crash 100 miles Northwest of Nellis AFB in the Nevada Test and Training Range. 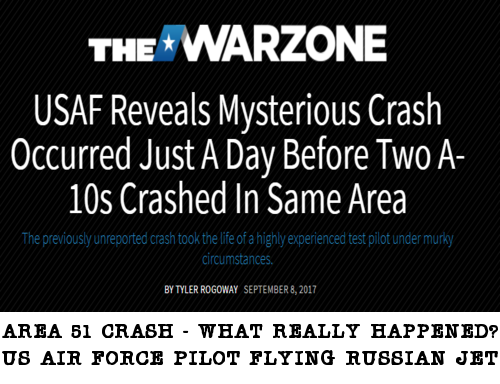 Speculation about the crash was fueled by Air Force media releases that did not indicate the type of aircraft that was being flown by Lt. Col. Schultz on Tuesday, September 5, 2017 when the accident occurred. There was also a delay in the story reaching news media that raised further questions since the accident was reported after another, unrelated accident involving two A-10s, was reported sooner. Whether the U.S. Air Force will follow-up with additional information in the crash of Lt. Col. Eric Schultz is unknown. If Lt. Col. Schultz was involved in testing, evaluation and training with opposing forces aircraft in a classified program that remains ongoing the information may never be released. 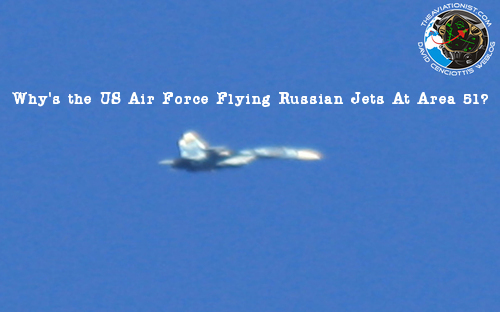 Additionally, the accident, if it did involve non-U.S. opposing forces aircraft, may compel the Air Force to change its opposing forces training program as seen in the now famous Phil Drake photos of the Su-27 outside Groom Lake as seen below. While original speculation from this Popular Mechanics story was that Schultz was flying a highly classified, top-secret jet as he had flown countless such missions before, as we learn from their story, the Air Force has released a statement saying "information about the type of aircraft involved is classified and not releasable." Asked this weekend about the crash, Air Force Chief of Staff David Goldfein said, "I can definitely say it was not an F-35." With the world now poised at the edge of a possible World War 3 breaking out at any moment with tensions at nearly a boiling over point as massive Russian war games Zapata 2017 have eastern Europe rattled while in the Ukraine, massive NATO military drills have begun right on Russia's border, there is already speculation that the possible Russian military jet that Lt. Col. Schultz was flying may have been in preparation for some kind of a 'false flag' event. As has long been warned, nearly every major war that the US has been involved in has begun with a 'false flag' event or an outright lie and while the US military routinely trains to fight with non-US jets as an 'aggressor squadron', with the Russia-hating globalists still seemingly in charge of our foreign policy here in America as warned by former Trump advisor Stephen Bannon, a mad rush towards the apocalypse is still playing out before our eyes. As to why they'd WANT such an apocalypse, as Steve Quayle recently wrote in an SQnote that he left while linking to this Zero Hedge story reporting that the US has threatened to cut off China from the SWIFT payment system if they violate North Korea sanctions, "Pick a fight and disappear in the night! 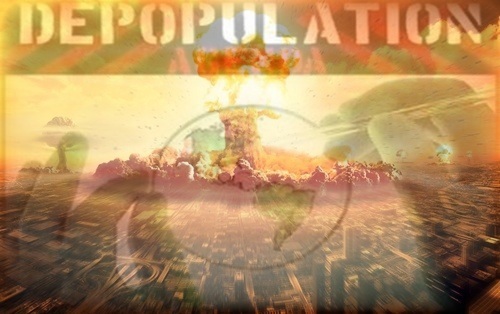 World War 3 MUST come to pass as well as the death of 2/3 the world's population if the globalists have their way!" And so we go onwards towards World War 3 and possible nuclear annihilation, the globalists most likely completely aware that any war that breaks out between the US and Russia WOULD come here to US soil - just as they'd want it. It's obvious now that anyone within the US government still pushing for a war between the US and Russia WANTS America's total destruction. We now feel that it is our duty, as Russians living in the US, to warn the American people that they are being lied to, and to tell them the truth. And the truth is simply this: If there is going to be a war with Russia, then the United States will most certainly be destroyed, and most of us will end up dead. If tomorrow a war were to break out between the US and Russia, it is guaranteed that the US would be obliterated. At a minimum, there would no longer be an electric grid, no internet, no oil and gas pipelines, no interstate highway system, no air transportation or GPS-based navigation. Financial centers would lie in ruins. Government at every level would cease to function. US armed forces, stationed all around the globe, would no longer be resupplied. At a maximum, the entire landmass of the US would be covered by a layer of radioactive ash. We tell you this not to be alarmist, but because, based on everything we know, we are ourselves alarmed. If attacked, Russia will not back down; she will retaliate, and she will utterly annihilate the United States. We are absolutely and categorically certain that Russia will never attack the US, nor any EU member state, that Russia is not at all interested in recreating the USSR, and that there is no “Russian threat” or “Russian aggression.” Much of Russia’s recent economic success has a lot to do with the shedding of former Soviet dependencies, allowing her to pursue a “Russia first” policy. But we are just as certain that if Russia is attacked, or even threatened with attack, she will not back down, and that the Russian leadership will not “blink.” With great sadness and a heavy heart they will do their sworn duty and unleash a nuclear barrage from which the United States will never recover. Even if the entire Russian leadership is killed in a first strike, the so-called “Dead Hand” (the “Perimetr” system) will automatically launch enough nukes to wipe the USA off the political map. A map of the Area 51 test ranges where the Phil Drake photos of a Russian SU-27 jet were taken back in November of 2016. And while we're quite sure we'll never get any truth on what happened recently at Area 51 from a government that relies upon lies and secrecy in its race towards tyranny and what will inevitably result from that, its own self-destruction, as we see in this February of 2016 story from Lew Rockwell, why should we expect truth when it wasn't until 2013 that the CIA finally admitted to the existence of Area 51, despite secret programs going back to the 1940's and 50's? 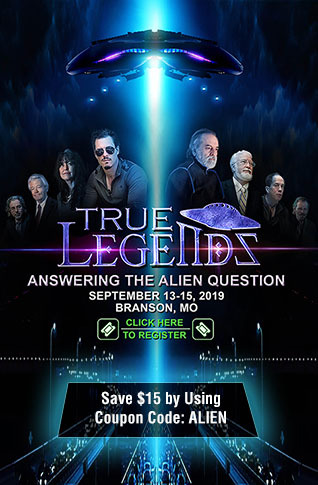 With an endless series of massive government abuses near Area 51 as exemplified by this 2015 story reporting upon the Sheahan family being kicked off their land as a federal judge officially handed 400 acres owned by them to the Air Force, it's easy to see that whatever is REALLY going on there, it's none of the American people's business, hence our nation's descent into tyranny. With the handwriting now clearly on the wall that the psychopaths and globalists want a devastating war to bring about their desired 'massive population culling', it may be a matter of time before they get their wish with war games being played on all sides and 'an accident' just waiting to happen. With Russia in possession of some of the most powerful nuclear weapons on the planet with the appropriately-named 'Satan 2' nukes capable of wiping an area the size of France or Texas off the map, we pray President Trump and the military move cautiously in these unchartered waters in the days, weeks and months ahead or we may all soon witness America's long-prophesized destruction.